Security guru Bruce Schneier is holding a contest for the best redesign of the Transportation Security Administration logo. The many great submissions have been whittled down to five finalists. Unfortunately, one of my favorites did not make the cut. You have until next Sunday to vote. 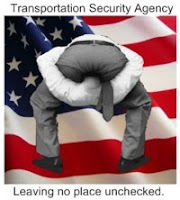 That could be a logo for alot of government agencies. Can We Go To Grandma's House Every Sunday? Will The Soldiers And People That Died Notice? Did They Run That Name By A Focus Group? So It's Okay If You Mean Well? Can't You Smell That Smell? I Know You Are But What Am I? Barefoot Running - Is Bad!